DON'TBE A MUG...GET A MUG! Get the Galaxy's Greatest Comics delivered to your door - or he'll go up to 4 on ya! All UK readers who subscribe to 2000 AD and the Judge Dredd Megazine before 30 August 2003 will receive a Mean Machine mug*, worth £4.99 - the first in a series of four, available soon from Tharg's Future Shop! For the bargain price of just £9.00 per month**, you'll get each new Prog and each new Megazine delivered direct - before they're on sale in the shops! Postage is free, and you'll actually save money! To subscribe, click on the Subscribe link above, call the Subs Helpline on (UK) 01621-877-250 or email subscriptions@2000ADonline.com. So what are you waiting for, Earthlet? Do it now, before you make Mean butting mad! If you prefer to pay an annual fee, send a cheque for £108 to 2000 AD Subscriptions, 8 Galliford Road, Malden, Essex, CM9 4XD. Subscription to 2000 AD only (49 weekly Progs, plus the 100-page Christmas special) is £6.25 per month (£69 pa). 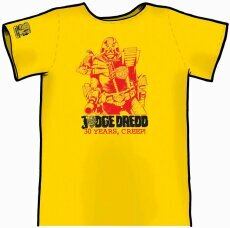 For 13 issues of the four-weekly Judge Dredd Megazine only, you pay £4.65 per month (£52 pa). All prices quoted are UK only. For overseas rates, see the Subscibe page. *Subject to availability. Free mug is only available to subscribers to both 2000 AD and the Judge Dredd Megazine. **New UK subscription. Minimum contract 12 months. One-month cancellation period required after 12 months.